On Friday morning, November 2nd, 2018, two hundred and twenty-two people traveled to FIU’s waterfront Biscayne Bay campus to attend FIU Online’s 17th annual FIU Online Con. The conference opened with an empowering keynote from an internationally recognized and seriously creative multimedia artist, Phil Hansen. Through his innovative and jaw-dropping approach to working within his challenging limitations to create art, he encouraged every audience member to break down their self-limiting beliefs, ask honest questions, and get creative. 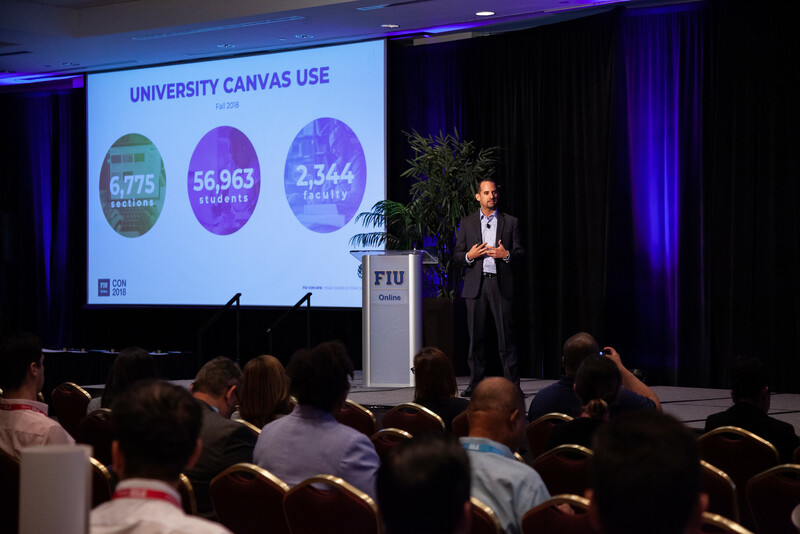 FIU Online’s Assistant Vice President, Joseph Riquelme, took the stage to share the department’s initiatives and dedication to high-quality online courses. He introduced innovative edtech resources available to faculty such as ARC, a tool which makes a video a two-way collaboration between instructors and students, NBC Learn, Lynda.com, and more. Joseph Riquelme takes the stage to share department initiatives and achievements. 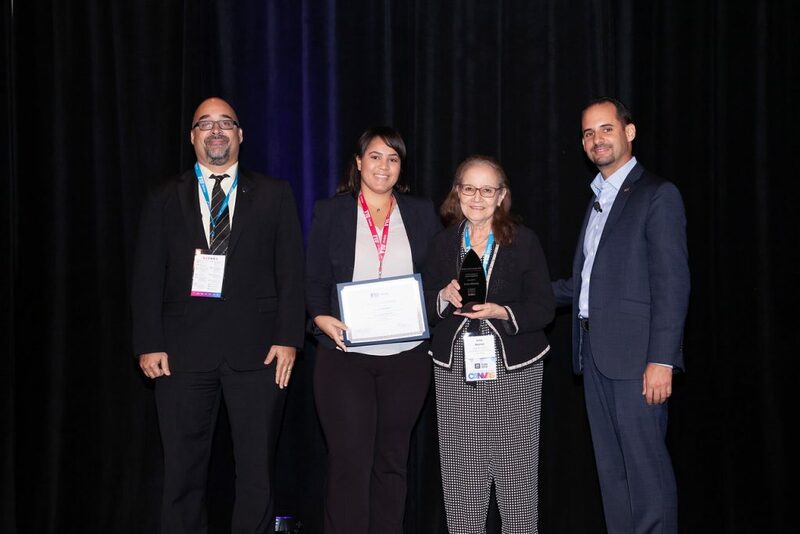 Award recipient Irma Alonso and Instructional Designer, Jennifer Echeverri. Throughout the day, engaging breakout sessions ranged from the power of student reflection to the growing opportunities for artificial intelligence in education. “Canvassador” Kona Jones taught us some tried and true Canvas tips we all needed to hear. Here’s one: Due dates on Thursdays and Sundays can help deter students from working at the last minute. 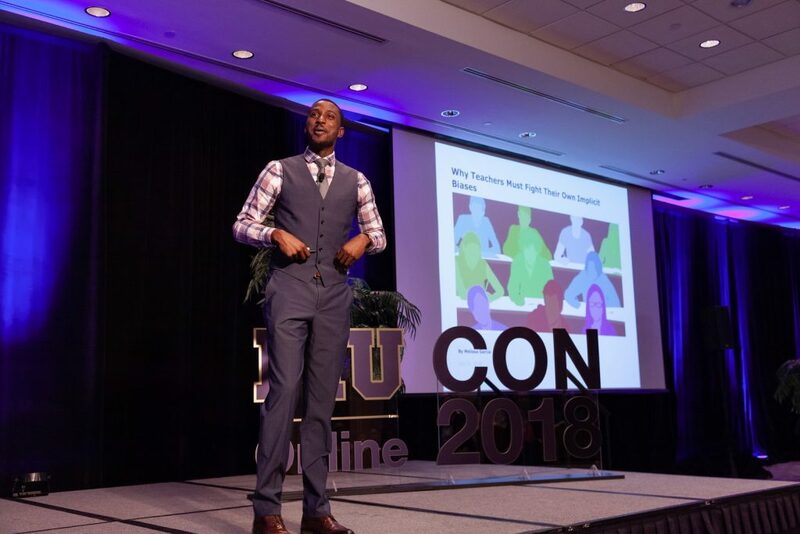 The conference ended on a high note with a powerfully positive speaker whose name you may recognize from the Ellen show, where he was celebrated for his creativity and determination with his second-grade class. Michael Bonner inspired educators to find ways to encourage their students to learn and grow despite all challenges. Thank you to all the FIU faculty who joined us this year at the FIU Online Conference 2018. View the conference agenda for a summary of the sessions offered. We encourage our faculty to check out our future conferences at our FIU Online Professional Development page. Jennifer Antoon is an instructional designer for FIU Online. After studying adult learning theories in her master’s program and implementing them during her time as an adjunct professor, she became interested in discovering and creating learning activities that engage and motivate adults.